Radiance Media’s Varun Manian and Y Not Studios Sashikanth have jointly produced Vaaiyai Moodi Pesavum and Kaaviyathalaivan in the past. Now, Y Not Studios Sashikanth is joining hands with CV Kumar’s Thirukumaran Entertainment for their new project titled “Irudhi Suttru”.This is the first time that, these two big production companies are joining together to produce a movie. Cv Kumar known for his knack of identifying money spinning scripts with a difference, this film will be another feather to his track record. Madhavan, Nasser, Rithika, Mumtaz and many others are roped in to play pivotal roles. It will be a billingual Movie (Tamil and Hindi) directed by Sudha Kongara Prasad. She has assisted director Maniratnam and has already directed the movie “Drohi” starring Srikanth and Vishnu Vishal. Santhosh Narayanan does the music with cinematography by Shiva, editing taken care of national award winning Praveen KL and art direction by Santhanam, This comeback sports movie with Madhavan playing a boxing coach. 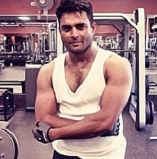 Madhavan had been literally living his days at the gym to convincingly look like a boxing coach. All the best to the team. People looking for online information on Actor Madhavan, CV Kumar, Maniratnam, Sashikanth, Sudha Kongara, Thirukumaran entertainment, Y Not Studios will find this news story useful.